Resident Perspective: "Putting the 'Luxe' in Luxury Loft Living!" One of the key benefits of an automated package management system is that your residents are going to be happier living in your apartment complex than before. Happy residents make for a successful multifamily property; boost resident satisfaction, and you improve retention rates, garner positive online reviews, and make managing your property a more enjoyable experience overall. 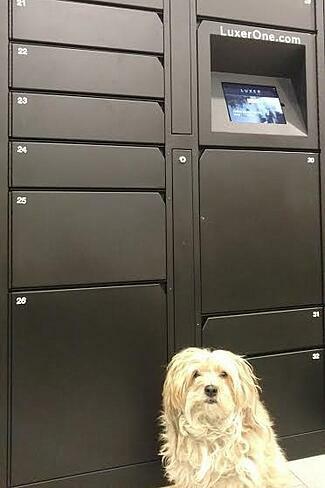 So what do residents actually think of a package locker system? Check out this firsthand account (complete with a cameo from her pup!) from a resident at The Lofts of Merchants Row, which installed a new Luxer Lockers system in 2017. This post was originally published March 6, 2017 on The Lofts of Merchants Row Blog. You can check out the original here. Luxury can have many different connotations, but it does not necessarily mean expensive or excessive. In fact, in many ways, it means the exact opposite of that—but more on that later. For me, ‘luxury’ means the ease of living. 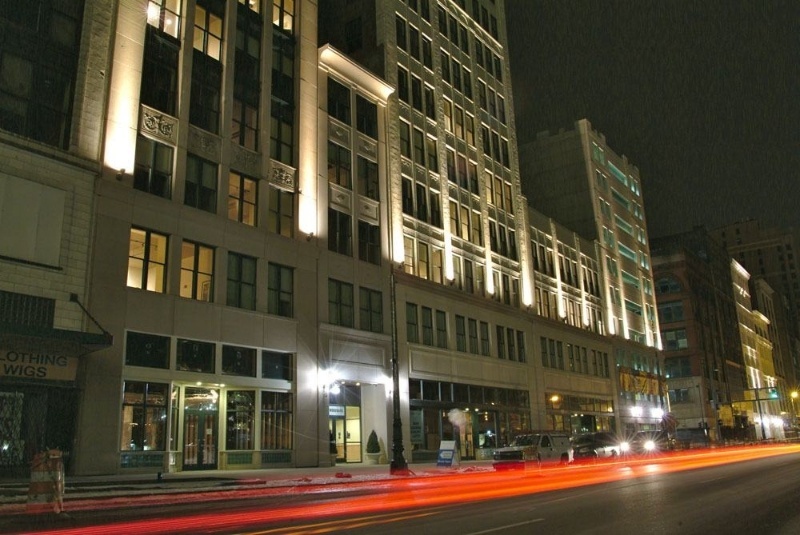 And my Downtown Detroit Loft has just added one more luxury to its list of conveniences and amenities—and The Lofts of Merchants Row is the first in not just Detroit, but Michigan, to offer it. While definitions of luxury include mentions of going beyond the necessities of life, the luxury of my Downtown Detroit Loft allows me to accomplish the things I need to get done more easily. And this includes the things I don’t necessarily like doing. One of the things I least like doing is shopping. I mean driving from store to store, wandering from aisle to aisle, sorting through rack after rack, and then carrying bag after bag from my car to my door. Just describing a day spent shopping makes me shudder. So, the ease of online shopping has been not a luxury, but a lifesaver for me. I get my laundry detergent shipped to me (because nothing is less fun than doing chores like laundry—unless you add to that chore running to the store, buying detergent, and then lugging it home so you can do your laundry…). I get Little Dog’s food shipped to me (because I wouldn’t call my loft home if she wasn’t here to greet me, and I wouldn’t dare step foot in the door if she hadn’t been fed). I got a tire inflator shipped to me (avoiding a charge on my roadside assistance since I couldn’t actually drive to an auto supply parts store—shudders aside—to get the tire inflator to fix my flat). I got my new laptop for work shipped to me (because all the above necessities would not be possible for me to purchase online and with ease without that!). Okay, and I get books shipped to me. Books and boots. These may not be considered necessities by some—but they are by me. And, fine, add to books and boots some biscuits for Little Dog, and these are probably my most frequent—not excessive, but frequent—purchases. But online shopping also means shipping. And sometimes with my work schedule does not allow me to be either be home to accept receipt of the package or to pick it up from the leasing office in the lobby after they open or before they close, even though they have early morning and evening hours. And because books are one of my most frequent purchases (and I might also add, a necessity for my work), I am also a member of Amazon Prime—one of the benefits of which is that I get free weekend and late evening delivery. But this doesn’t do me any good if the delivery person cannot leave it for me because there is no one to sign for it or if I cannot be here to receive the package/pick it up from my leasing agent who signed for it. 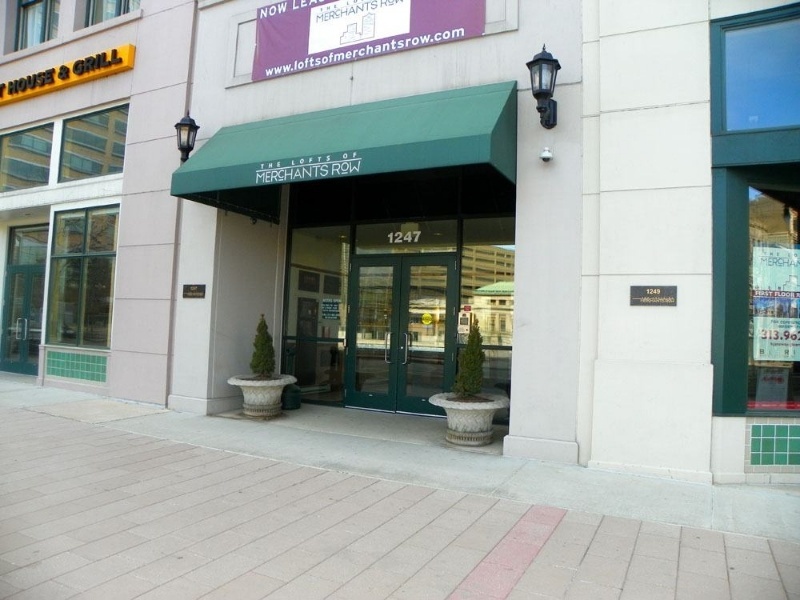 Well, always on the cutting edge of the convenience that creates luxury, my Downtown Detroit Loft, The Lofts of Merchants Row, has gone through the effort and expensive to alleviate this issue for me and the other residents of my building. They have added a Luxer One unit to my building. 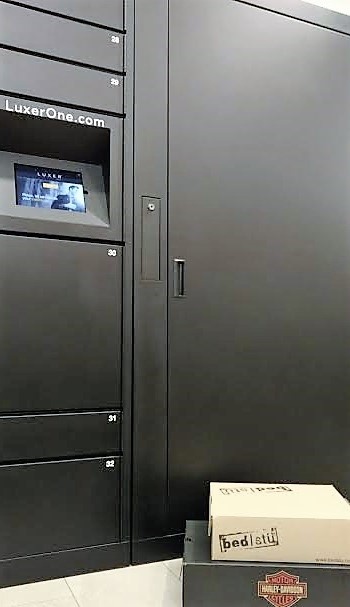 Luxer One allows delivery people to place any package I receive in a secure locker which negates the necessity of me being there to sign for it. The system then sends me a text, alerting me to the fact that I have received a package (best texts ever!) 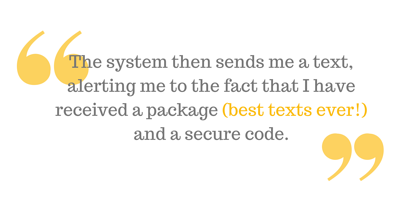 and a secure code by which I—and only I or someone I give the code to—can retrieve my package. You just punch the access code into the touch-screen monitor and the locker with your package in it pops open! (Little Dog already thinks I have magical powers, so I can’t wait for the first time I pop open a locker with biscuit treats in it for her.) The lockers range in size from slightly larger than legal envelope size to large enough to house enough boots to outfit an entire rodeo. Yep. That’s the analogy I went with, because, well, boots…. This means that when I’m not home to sign for my tire inflator that came on a Sunday (so I could get to work on Monday), I can still get my package and get to work on Monday. Okay, maybe getting to work on Monday isn’t such a great thing. But it’s necessary if I want to have any of the necessities of life. Once again, The Lofts of Merchants Row Luxury Lofts has found one more way to make what I need to do easier for me to do. And remember when I mentioned earlier that expensive need not be a part of the definition of luxury? 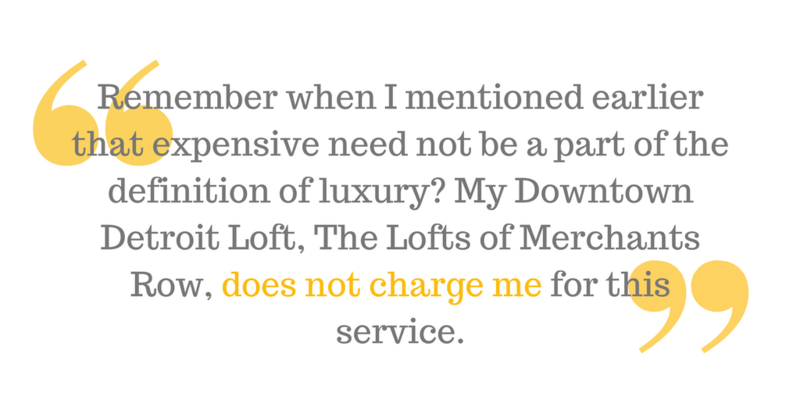 My Downtown Detroit Loft, The Lofts of Merchants Row, does not charge me for this service. …Maybe even more than I love boots. Thinking package lockers might be a good fit for your property? Check out 6 Questions to Ask Yourself Before Getting Package Lockers to learn how to set your property and your package management system up for success. Or connect with us directly here! Welcome to your one-stop destination for the latest in package acceptance and delivery innovations! Subscribe to this blog to learn how multifamily communities can stand out with smart technology and unique amenities that keep residents happy.